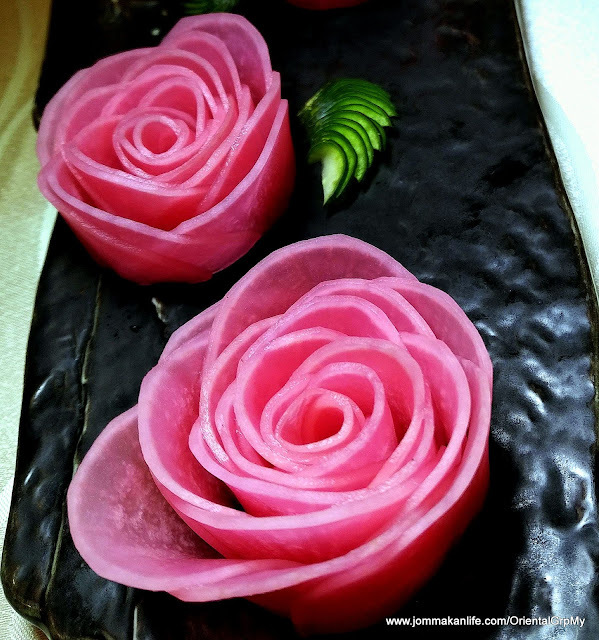 A rose by any other name tastes just as nice when you dine at The Oriental Group's yearly culinary showcase. 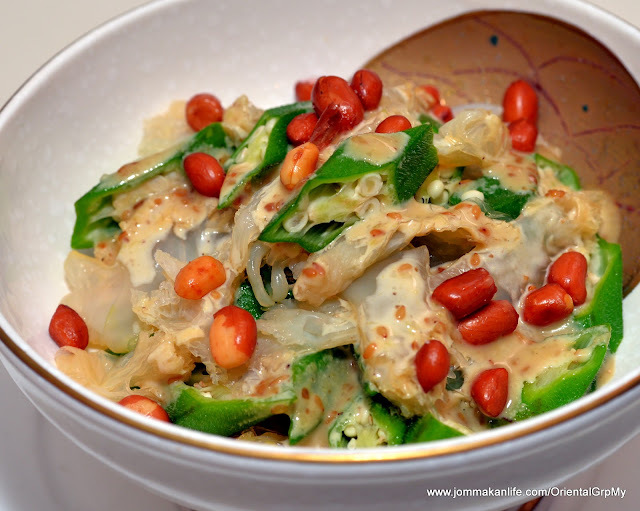 This time, the diversity and abundance of China and the Nanyang (South East Asia) serve as the hot bed of inspiration for Group Executive Chef Justin Hor. 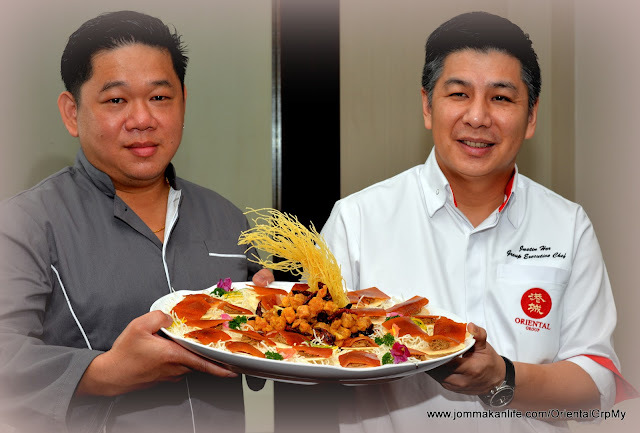 As a passionate advocate for flying the flag high and shining the spotlight on Chinese cuisine, Chef Justin joins forces with Corporate Executive Chef James Ho of Ruyi, Malaysia. 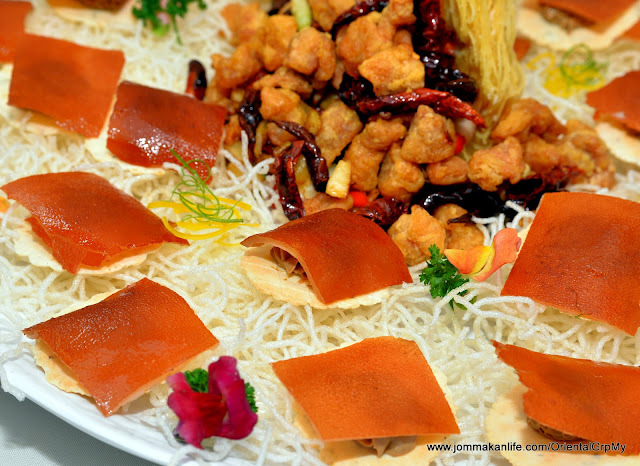 The dynamic duo's collab is in line with The Oriental Group’s past initiatives in bringing definitive menus featuring lou si fu or veteran master Chinese chefs and their signature specialities to educate the dining public and gain greater appreciation of Chinese food and cooking. 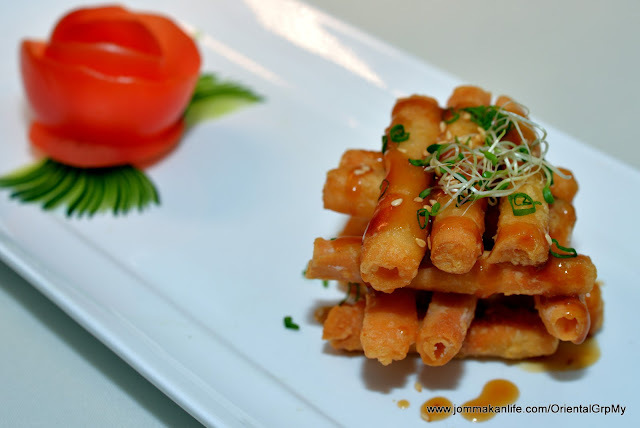 The nostalgic 1960s, past decades of Hong Kong cuisine, and the legacy of Teochew food were some of the chosen themes in the past. The opening volley by Chef James Ho is already a conversation-stopper. 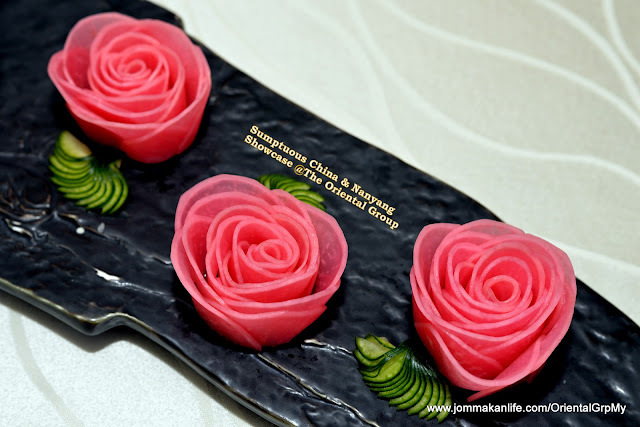 Delicate and thin slices of crunchy radish are fashioned into pretty rose blossoms, to form Pink Roses of Pickled Radish (RM28). Stained pink using boiled red cabbage water, the radish 'petals' taste tantalisingly salty-sweet after being pickled with preserved plums. 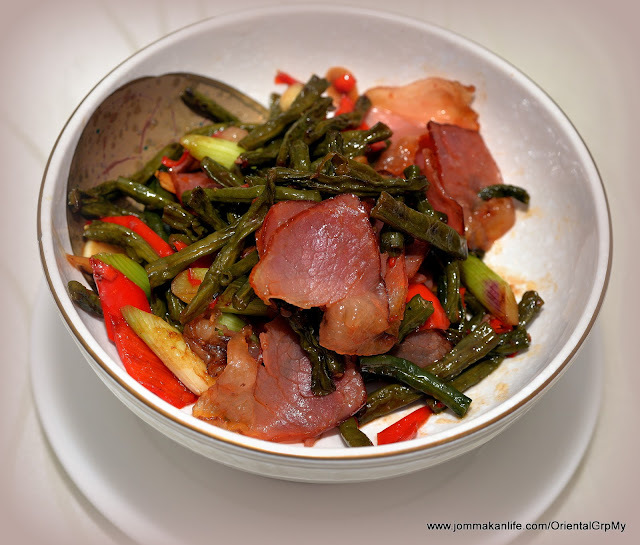 A pleasing starter to prime the palate for the curtain-raisers of Spicy Garlic Sauce Pork Belly (RM28) and Hunan Waxed Meat & Dried Long Beans (RM38). 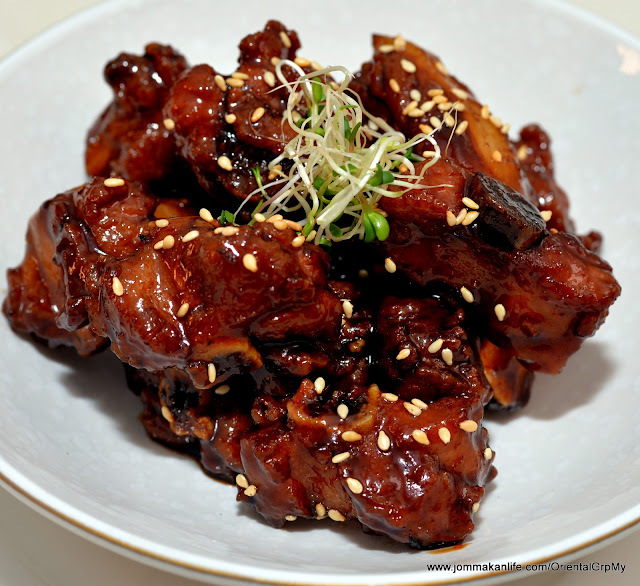 Streaky belly pork slices drizzled with sesame seed-flecked, garlicky and punchy hot Taiwanese oyster sauce makes it a notable tastebud-teaser. 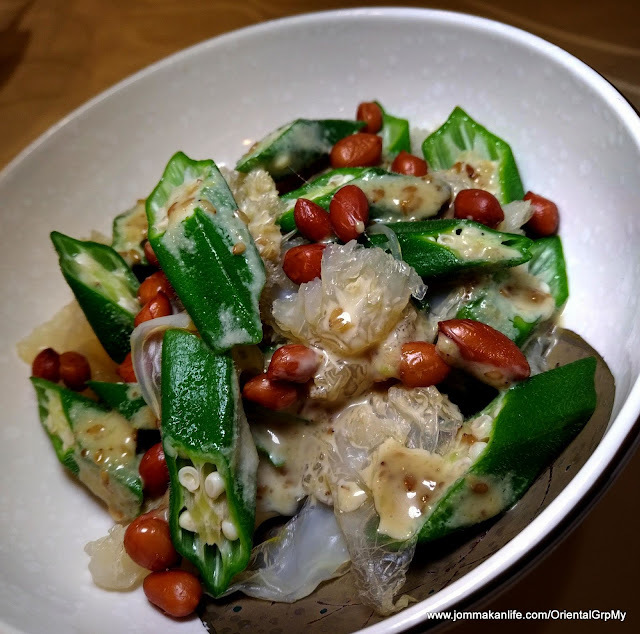 While the latter appears seemingly simple and no frills, we discover the painstaking efforts that goes into preparing the dried long beans before the appetiser hits the table. 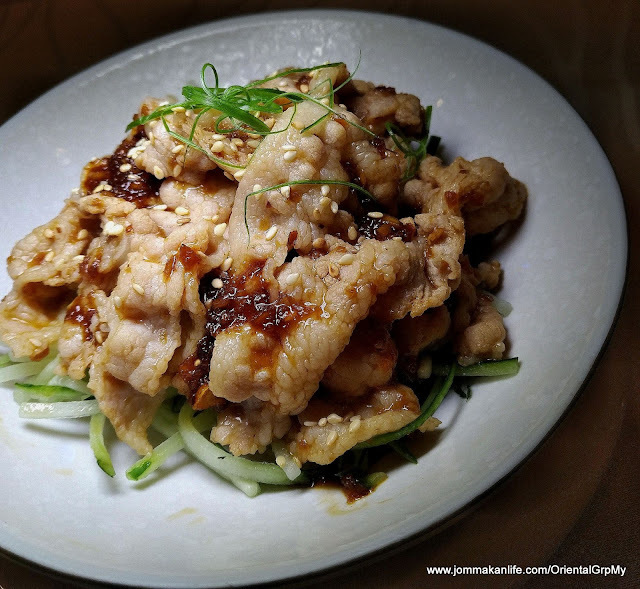 Not to be outdone, Chef Justin Hor steps up to the plate with stellar creations such as Jellyfish & Okra in Wasabi-Sesame Sauce (RM28), Cod Fish Rolls (RM28) and Zhenjiang Sweet & Sour Iberico Baby Pork Ribs (RM28). 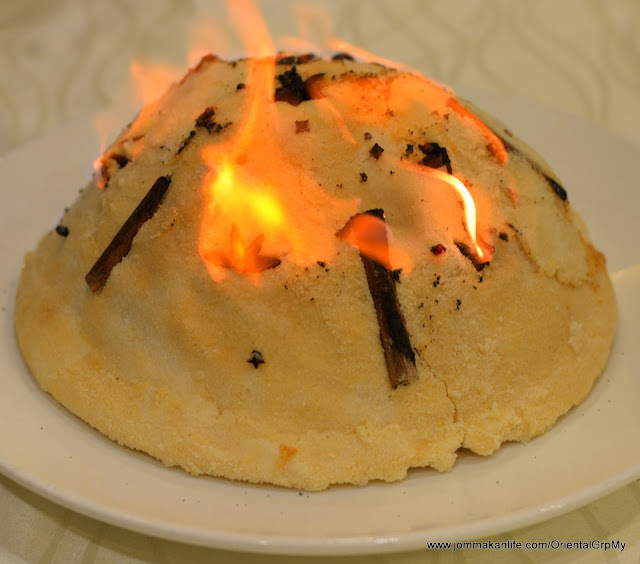 The mildly hot zestiness with the crunchy-gelatinous soft textural combinations of the first appetiser enhances it irresistible appeal. As for the batons of crispy, lightly-battered cod, we find the buttery shoyu-mirin sauce bestows a delightfully lush finish. 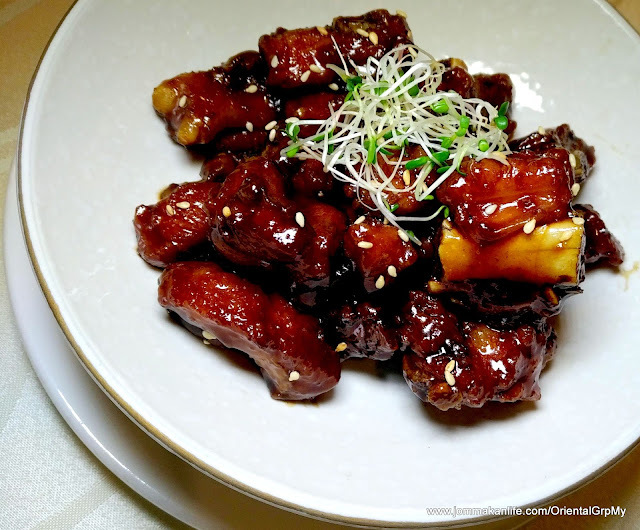 Premium Zhenjiang vinegar is the key condiment to accentuate the tender ribs. 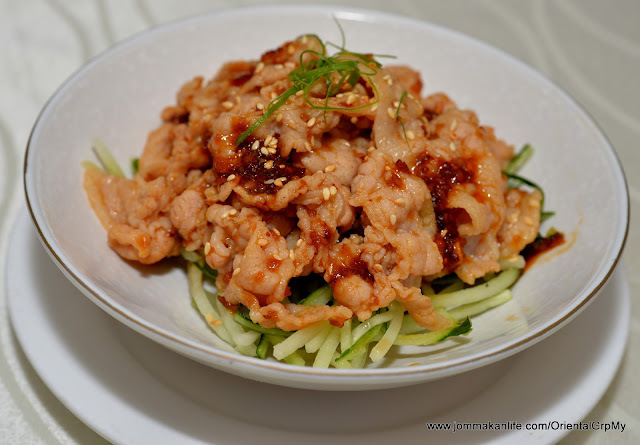 It's one of the best sweet and sour sauce rendition I've encountered, leaving the chunks of pork slicked with such bright and flavourful tangy-fruity-savoury nuances that leave us wanting more. 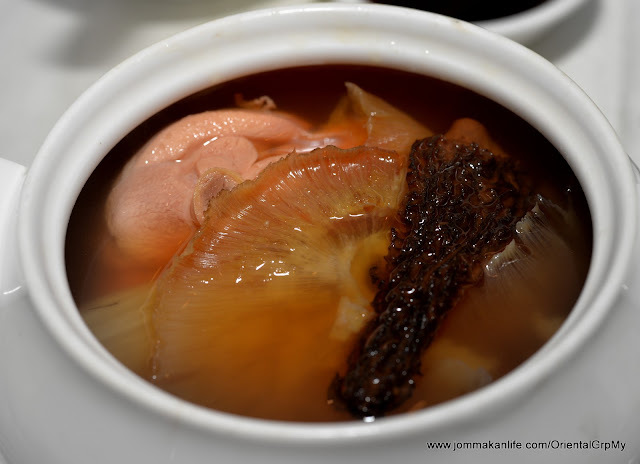 Boiled for over 8 hours in a rich, superior stock of pork, old chicken, dried conch and Yunnan ham, the Superior Shark’s Fin Soup with Morel Mushroom (RM118 per person) is a cherished classic updated with the inclusion of morel mushroom. 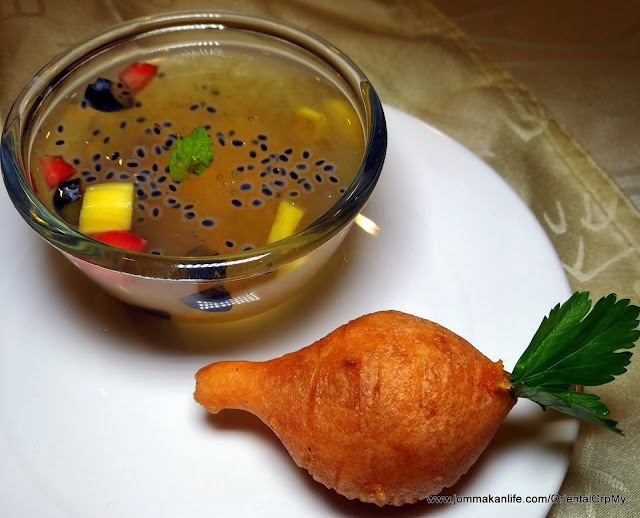 A heartwarming broth that beguiles with its hearty depth of oceanic sweet-savoury flavour dimension. 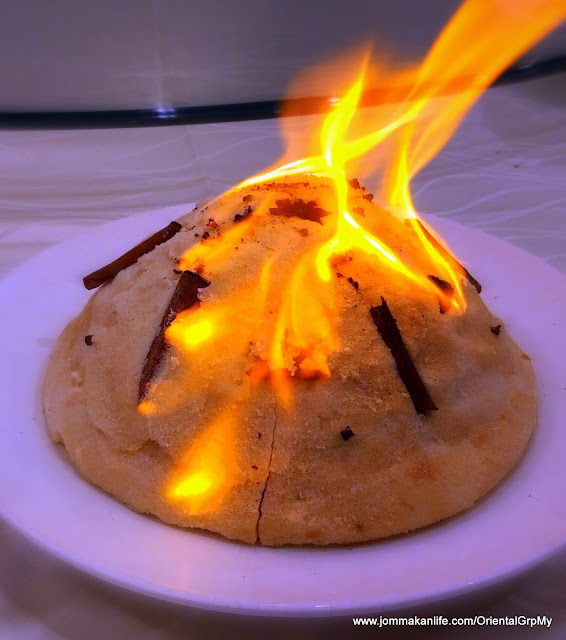 Expect a frisson of excitement when a salt dome crusted with cinnamon, star anise and cloves is set ablaze; a touch of dramatic flair to herald the serving of Salt Baked 3 Head Abalone with Truffle & Kombu (RM138 each, min 2 pcs per order). This pricey speciality ticks all the right boxes and then some, mainly due to the inventive East-West truffle and kombu pairing to amplify the delicacy’s unique deep-sea notes. 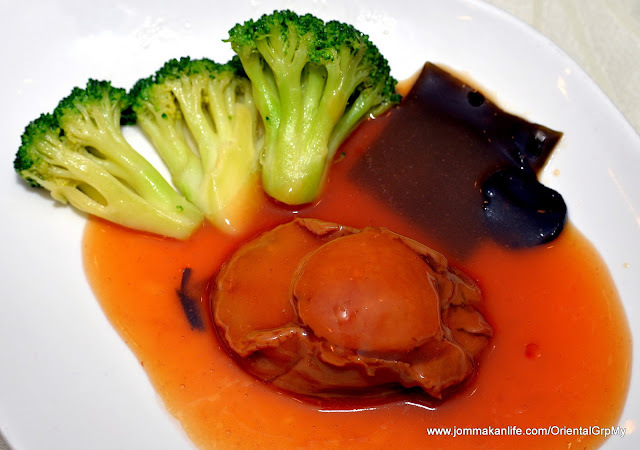 Hats off to both chefs for raising their game to create the exquisite Roast Suckling Pig with Foie Gras Mousse (RM398). 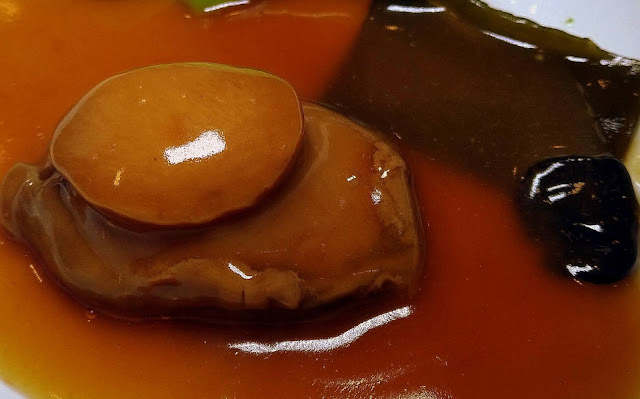 Not content with using French goose liver in its original form, they imbue the foie gras with Sichuan pepper and spring onion before blending it with sake and mirin into a lush, sublime mousse. 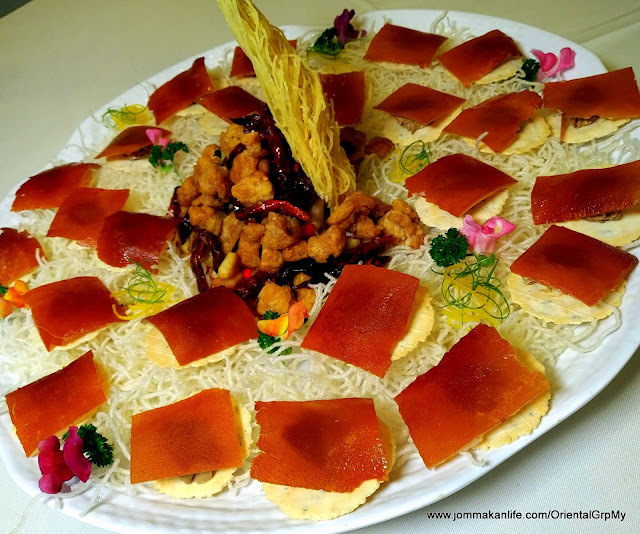 Piped onto wafer-thin water crackers, each foie gras rosette is then topped with a piece of crackly suckling pig skin to transform it into a dream epicurean dish fit for a king! Ever mindful of a dish’s flavour balance, the chefs proffer some deep-fried peppery hot, zingy ‘popcorn’ chicken, to help temper the cloying richness. 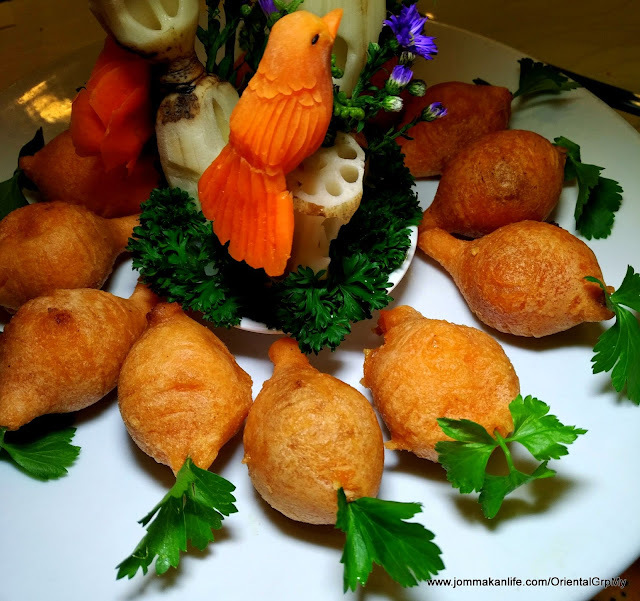 After his first unforgettable taste of the yellow corvina a decade ago, Chef Justin succeeded in sourcing the fish from China and imported it exclusively for this showcase. 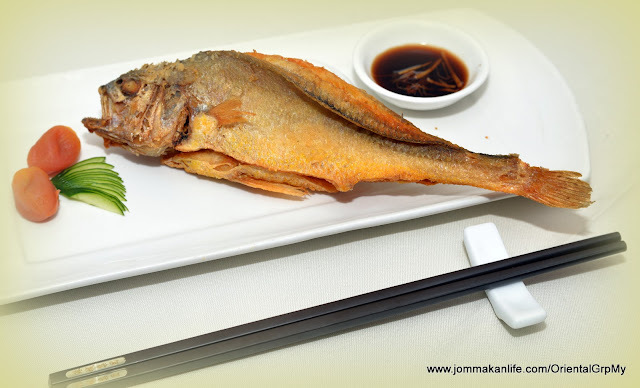 According to the chef, Deep-fried Yellow Corvina Shanghainese-style (RM38 each) is the best way to savour its mild, sweet taste. 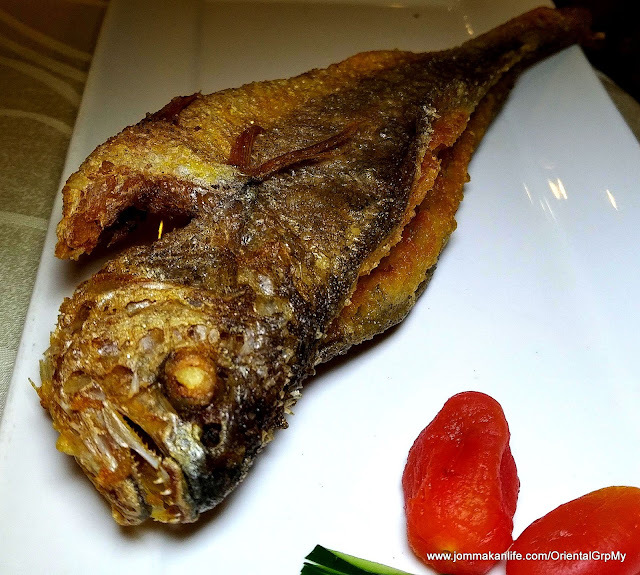 “The fish’s firm, flaky flesh is especially tasty along the spiny bone area where the natural oil is concentrated” said Chef Justin. 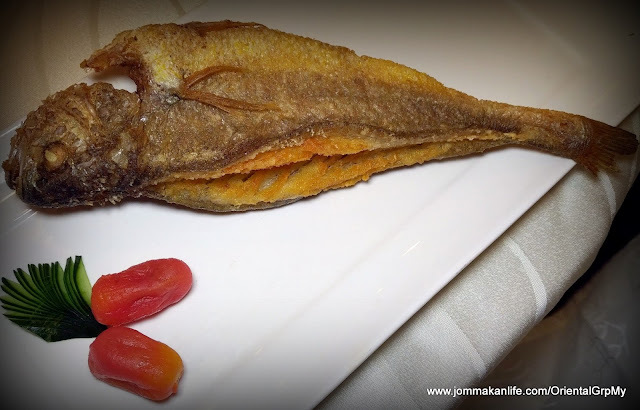 I find dipping the fish into the vinegar and ginger dip or eating it with marinated cherry tomatoes on the side helps to refresh the palate should the natural oiliness seems a tad overwhelming. 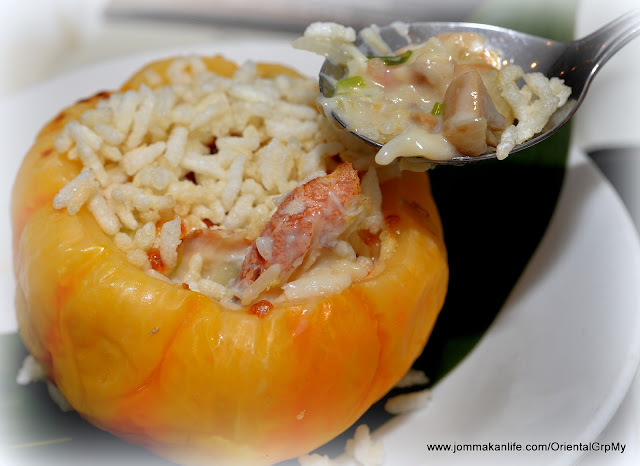 Pine nuts, crabmeat, mushroom and water chestnut dices give the Baked Rice with Cheese & Crispy Rice in Baby Pumpkin (RM28) a myriad of textural dimensions. 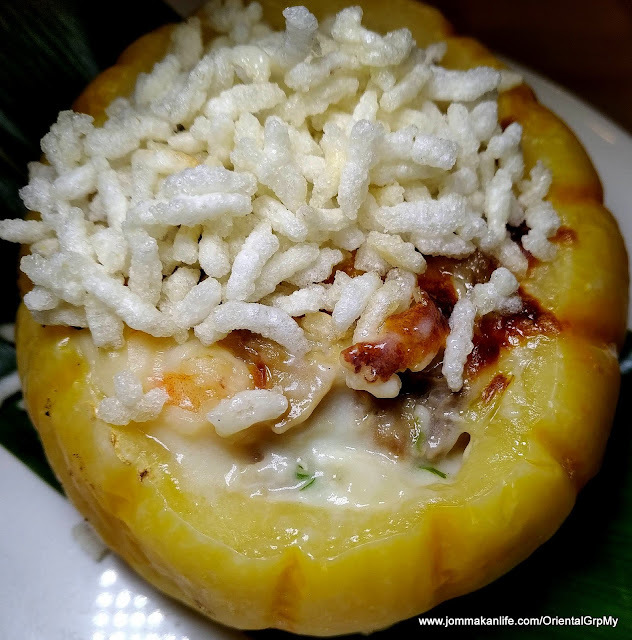 Sourced from Fujian, China, the baby pumpkins came flash frozen and hallowed out; a whimsical receptacle to hold the delicious baked rice, smothered under creamy cheese topping and crunchy rice krispies. 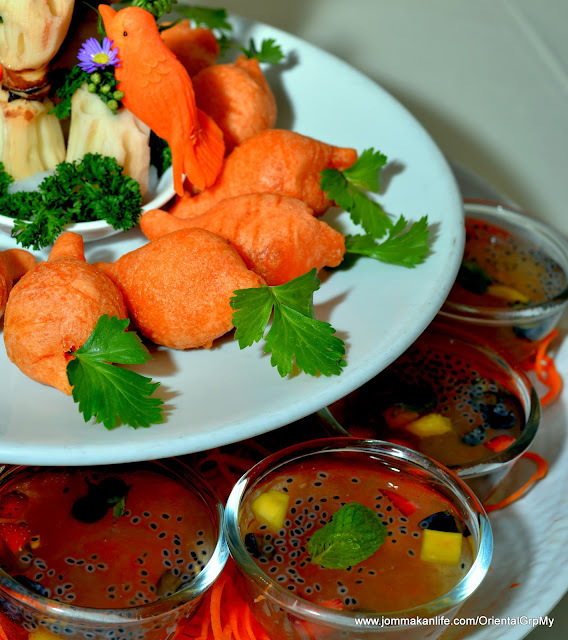 Dessert is never ho-hum with special servings of Refreshing Rainbow Bird’s Nest (RM28) and Peanut Lava Carrots (RM15 per 3 pcs) to tempt us. Light and refreshing, the Thai lemongrass jelly is enhanced by bits of blueberries, strawberries, jackfruit and basil seeds. 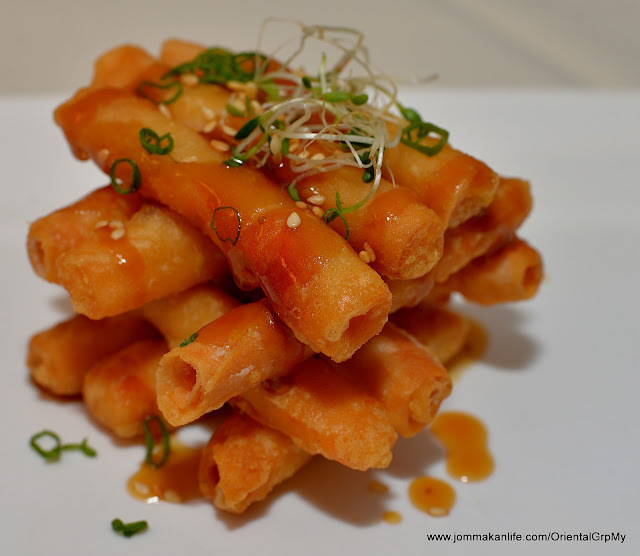 It took Chef Justin two months to reinterpret the usual sesame seed balls into plump ‘carrots’. 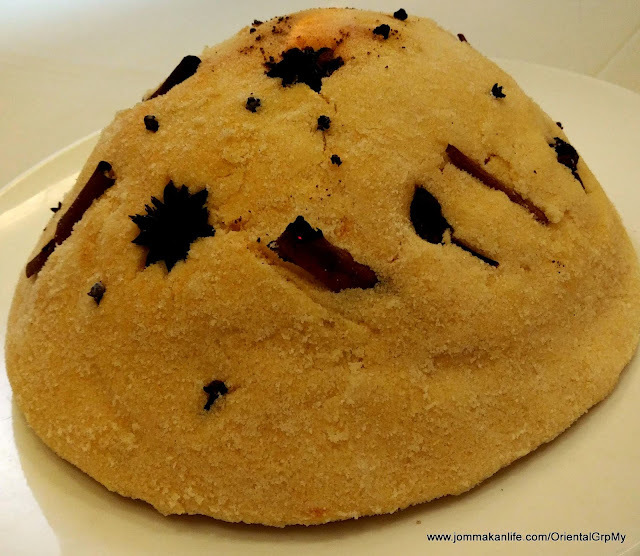 Naturally coloured with carrot juice, the outer chewy dough is made from a mixture of glutinous rice flour with cornstarch and wheat flour whilst the core yields a molten filling of crushed peanuts, sesame seeds, margarine and butter. 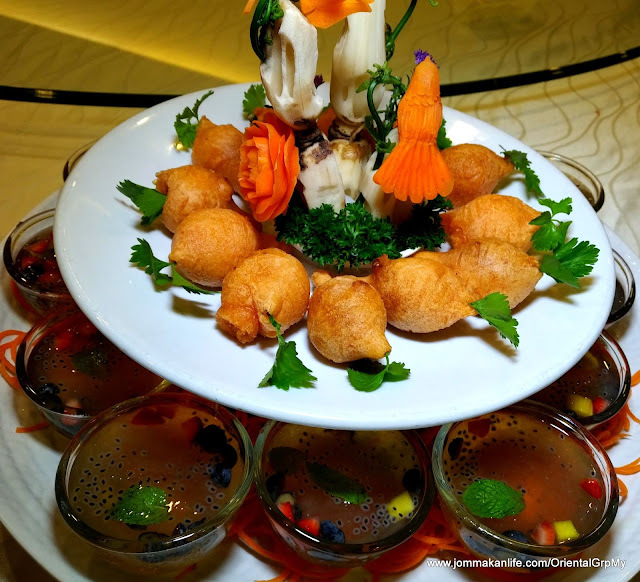 Alternatively, try the a la carte dishes at all participating restaurants under The Oriental Group until 31 August 2018.